Precious Merada and Matt Koch notched another win, sending the Colorado Futurity Open trophy home to owner Wagonhound Land & Livestock. The Colorado Reined Cowhorse Association (CRCA) enjoyed another successful Colorado Futurity October 22-25 in Castle Rock, Colorado. The association prides itself on listening to what exhibitors want and paying attention to current trends, and was rewarded for its efforts with 433 entries from nine states. The total payout reached $63,385 in prize money and $10,000 in prizes. After a rainy first day, the weather turned perfect, with temperatures reaching not the mid 70’s for the rest of the show. exhibitors were able to ride outside to prepare their horses and enjoy the scenic view and sunshine. The Douglas County Fairgrounds is located 20 minutes south of Denver and offers heated stalls and heated indoor arena show facilities. Matt Koch won the 18-entry Futurity Open riding Precious Merada for owner/breeder Wagonhound Land and Livestock, of Douglas, Wyoming. 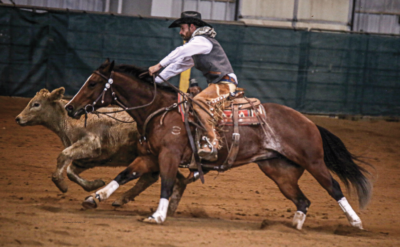 He and the talented mare marked a 76 – the high score of the in the cow work – to take the Championship, breaking a 221-point tie with Reserve Champion Luke Jones and Smart Guena Bell. “She was her usual self,” Koch said with a laugh, recalling her strong cattle event scores and weak rein work scores. They also won the herd work with a 75-point effort, and held steady in the reining with 70 point to earn $3,307 in all. Precious Merada has been a multiple futurity champion despite her reining troubles. In August she won the South Dakota Reined Cow Horse Association (SDRCHA) Rode to Reno Futurity and was Reserve Champion at the CRCA Mid-America show. Shiney Nu Annie and Chris Dawson were 2014 NRCHA Snaffle Bit Futurity Open Reserve Champions. Wagonhound Land and Livestock purchased the 2011 mare at the 2012 Carol Rose Quarter Horse Production Sale for $35,000. Read Complete Article CLICK HERE.